1966 World Cup (England Winners) 1st June 1st 1966, stamp values: 1/3d; 6d; 4d. 1966 Christmas 1st Dec 1966, stamp values: 1/6d; 3d. 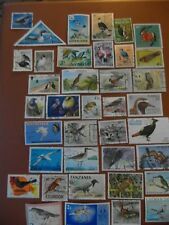 Stamps : World Birds selection fine used. 387 GI 1´3 Sh´P Air Battle over St Paul's Cathedral. 386 GH 9 P Anti-aircraft Artillery in Action. Consisting of 380 GB 4 P Flight of Supermarine Spitfires. Stanley Gibbons Catalogue Number: SG 784. Condition Report: Clean envelope in good condition. Aerogrammes unused (4) fine unused. Eire 20 x £1 block, 1972 Decimal . Ravenglass & Eskdale Railway Co FDC. with Cockermouth Cumberland FDI H/S. 1970 LITERARY ANNIVERSARIES (1/6d). Czechoslovakia collection 1918+ , 71 leaves. cd x 2, Amadeus Mozart/Pergolesi, Academy of St.Martin in the Fields. Cd x 2, Mozart & Pergolesi. Stamps , Egypt incl.1933 Airs, fine used. Wessex FDC. 1964 BOTANICAL CONGRESS < PHOSPHOR >. Ravenglass & Eskdale Railway Co FDC. with Ravenglass Cumberland CDS. 1970 LITERARY ANNIVERSARIES (5d). 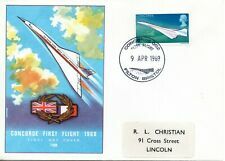 Great Britain 1995 Sir R.Hill. Edinburgh Philatelic bureau 16th January 1996. Ravenglass & Eskdale Railway Co FDC. with Ravenglass Cumberland CDS. 1970 LITERARY ANNIVERSARIES (1/6d). India 1957/58 map defs. 14 vals., fine used. Wmk unchecked. Photos and Details are of the item for sale. Stamps of Germany 'Deutsches Reich' o'pted, 1919 Bavaria, 'Freistaat Bayern' . 1919 Bavaria Germany overprinted 'Feistaat Bayern'. 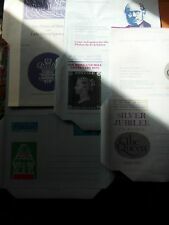 Stanley Gibbons Catalogue Number: SG 671p/678p. Condition Report: Clean envelope in good condition. Stamps : Ceylon album pages KGV+ (9) . 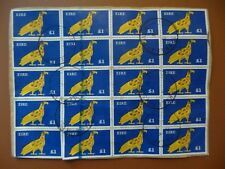 Stamps 1938 KGVI Malta pictorial defs to 2/6d ex 2/-mint & fine used 27cv£29.25. Malta KGVI defs mint & fine used. Other values available. A Judges limited post-card of Selworthy cottages England. post-card Lanzarote Isle from Arrecife Spain 31st August 1994. Wessex FDC. 1964 - BOTANICAL CONGRESS (PHOSPHOR). 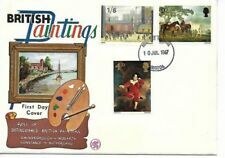 post-card of a Denmark image Copenhagen 16th May(?) 1986 to Devon England. Artist tale 44p, Travellers tale 63p, x 4. A Judges limited post-card of Selworthy cottages Somerset England. FIRST EVER CHRISTMAS PRESENT LONDONDERRY SLOGAN. 1967 CHRISTMAS (3d STAMP ONLY). BRADBURY CATALOGUE = £450.00 (FULL SET) >>>. Great Britain 1946 Victory 3d. w/control no. Stamps : Poland 1960+, fine used. Stamps USA 1938+ selection, fine used. Stamps : Yugoslavia 1950+, fine used. Salmon watercolour post-card of Lorna Doone country south-west England. Eire defs, incl. 1972 Decimals .